Ahlen, March 2011. – Combining a sense of style with the pioneering spirit, perfecting the synthesis of comfort and elegance whilst never losing sight of the meticulous passion for detail – this is a task that Kaldewei faces time and again in the development of new products. The European market leader for baths and shower trays presents a subtle design object for the bathroom that cleverly plays with the principle of imbalance: timeless, aesthetic design language meets comfortable functionality in the form of a wide bath rim on one side that serves as a seat or for storage, but can also be used for the individual positioning of fittings. The bathroom should be as individual as the modern user, a place of total intimacy. Bathrooms that enable the bather to combine function and enjoyment harmoniously in a design-orientated bath are the measure of all things. 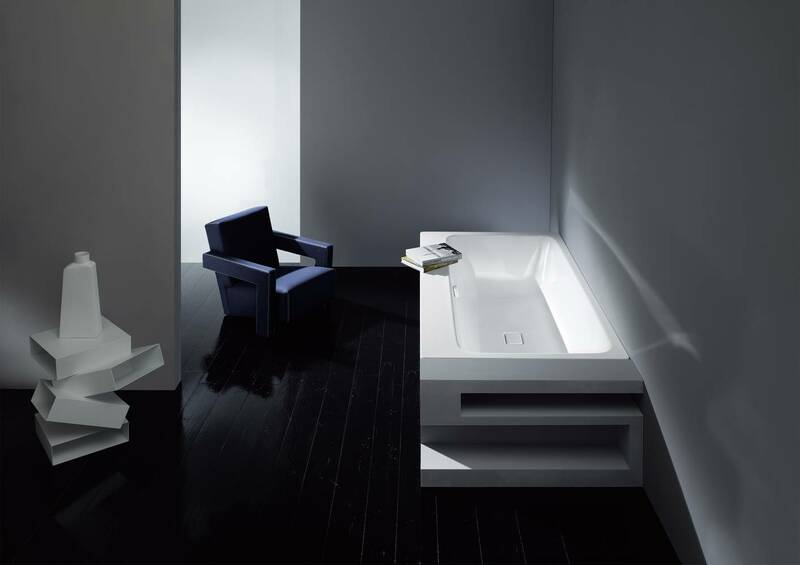 In the new Asymmetric Duo, Kaldewei has created a bath that more than meets this requirement: thanks to its timelessly elegant, straight-lined design with clear structures and organic interiors, the model progresses from the Ahlen-based company’s Avantgarde segment to the stylish focal point of the modern bathroom. The clear and precise shape of the asymmetrical bath with the wider rim on one side creates a charming contrast to the ergonomic, flowing character of its interior. 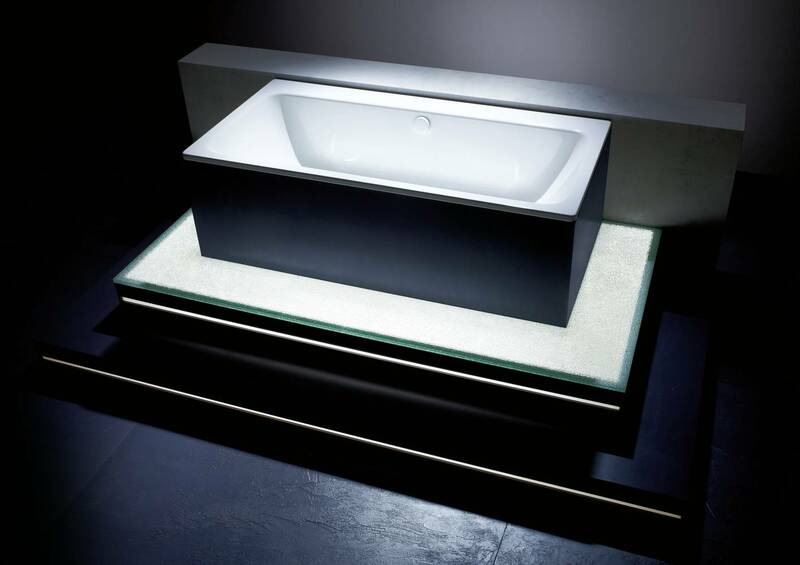 An optical highlight that not only creates tension but also offers the bather various options for use according to how the bath is aligned, and in doing so adapts to his (or her) individual requirements for functionality. The wider design of the bath rim – 12 cm, 15.5 cm or 18.5 cm, depending on the size of the bath – gives the Asymmetric Duo a greater spatial dimension. If it is aligned against the wall, its spaciousness provides the option of positioning the bath rim fittings with total individuality. Likewise, the bather can also use the bath rim as a spacious storage shelf for bath utensils, books or candles. Thus the bath can be enjoyed in an atmospheric ambience – a place to withdraw for relaxing hours away from our daily duties and obligations, to sink, luxuriously, into its warm depths and simply relax and unwind – with everything we need within easy reach. And if the wider rim is positioned into the room, it can be used as a comfortable entry or exit point. Children and adults will benefit from this extraordinary level of comfort and safety just as much as older people will, as it gives them the option of resting on the wider rim for a moment before entering or exiting the bath. 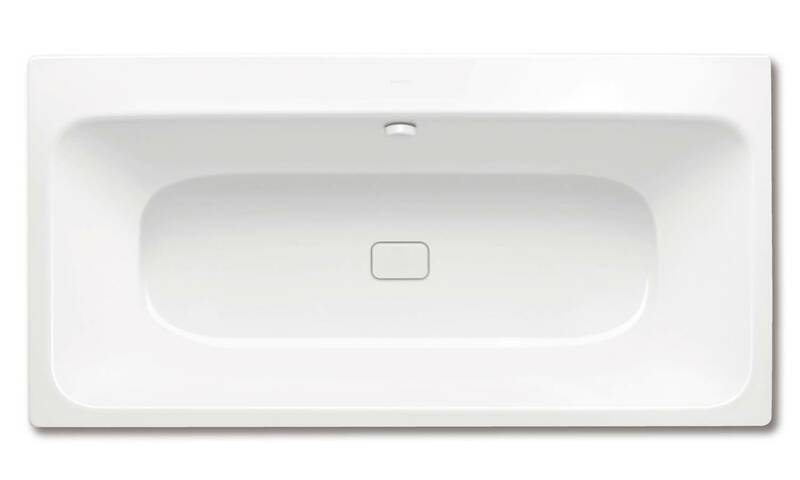 Elegant and balanced, the rectangular enamelled outflow cover – in the same colour as the bath – fits absolutely flush in the bottom of the bath, and emphasises the integral design of the Asymmetric Duo. An enamelled overflow knob is also available on request to enhance the balance of colour design and materiality. Depending on the installation situation, the overflow can be positioned either on the side with the wide rim or on the opposite side. The Asymmetric Duo was designed by Phoenix Design Stuttgart/Tokyo, and is available in three different sizes: 170 x 80, 180 x 90 and 190 x 100 cm. An exceptional focal point, it thus becomes a stylish design object in the most diverse spatial concepts that cleverly plays with design contrasts, and surrounds itself with the delightful charm of asymmetry. The bathroom should be as individual as the modern user, a place of total intimacy. Bathrooms that enable the bather to combine function and enjoyment harmoniously in a design-orientated bath are the measure of all things. 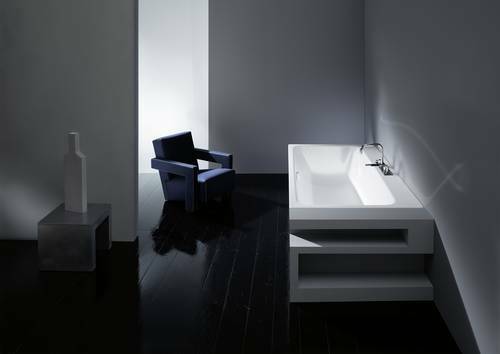 In the new Asymmetric Duo, Kaldewei has created a bath that more than meets this requirement: thanks to its timelessly elegant, straight-lined design with clear structures and organic interiors, the model progresses from the Ahlen-based company’s Avantgarde segment to the stylish focal point of the modern bathroom. If the wide bath rim is aligned against the wall, its spaciousness provides the option of positioning the bath rim fittings with total individuality. Likewise, the bather can also use the bath rim as a spacious storage shelf for bath utensils, books or candles. And if the wider rim is positioned into the room, it can be used as a comfortable entry or exit point. Children and adults will benefit from this extraordinary level of comfort and safety just as much as older people will, as it gives them the option of resting on the wider rim for a moment before entering or exiting the bath. The Asymmetric Duo was designed by Phoenix Design Stuttgart/Tokyo, and is available in three different sizes: 170 x 80, 180 x 90 and 190 x 100 cm. Elegant and balanced, the rectangular enamelled outflow cover – in the same colour as the bath – fits absolutely flush in the bottom of the bath, and emphasises the integral design of the Asymmetric Duo. An enamelled overflow knob is also available on request to enhance the balance of colour design and materiality.